Teach the UMT Supplemental Series Course - In this Teacher Training you will learn UMT Teaching Tips for each UMT LEVEL (PREP, 1 - 8 and COMPLETE) in the Supplemental Series. You will have unlimited access to 10 webinar video sessions that highlight music theory concepts from the RCM 2016 Royal Conservatory of Music Theory Syllabus as introduced in each of the 10 LEVELS in the Ultimate Music Theory Supplemental Workbooks. 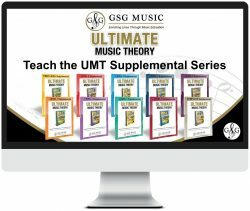 This Exclusive Course contains Teaching Tips to Supercharge Your Class with the NEW Ultimate Music Theory Supplemental Workbook Series! UMT has Got You Covered! 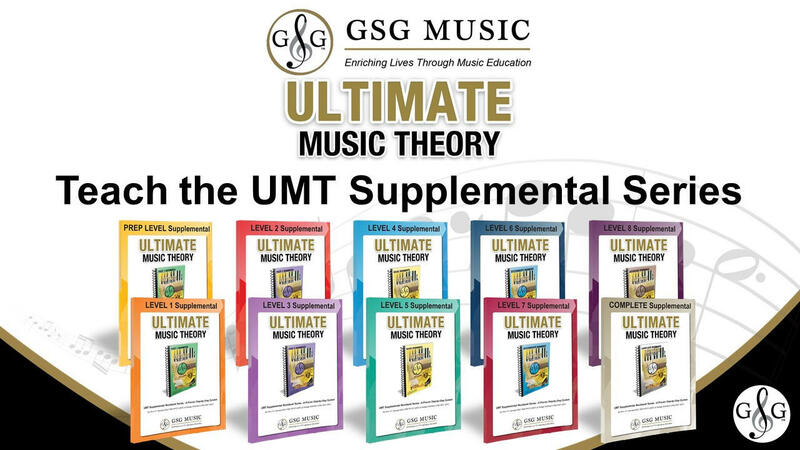 UMT Supplemental Workbooks include 3 Keys to Music Mastery! Form & Analysis - Plus Sight Reading NEW Ultimate Piano Pieces! Melody Writing - Imagine, Create and Explore Music Composition! Music History - Composers and Eras, Musical Styles & More! In each of the Music Theory Video LEVELS, you will learn teaching tips and short cuts in presenting concepts to your students in ALL Supplemental Workbook Levels. Enjoy this Free Teacher Training - Teach with Passion!